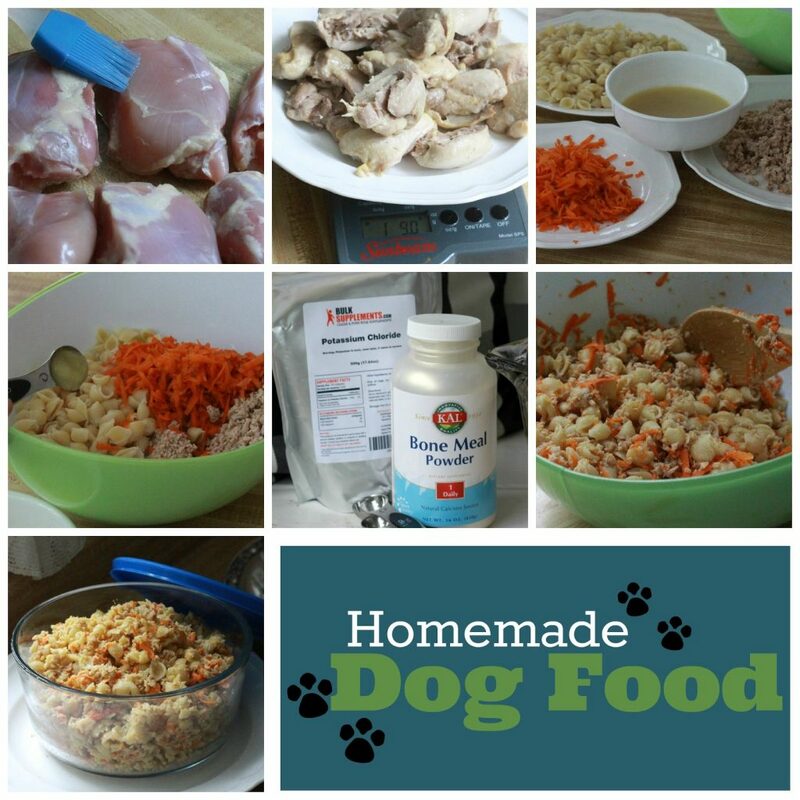 Yea, I know, it sounds crazy to make homemade dog food! But I learned, it doesn’t take as much effort as I thought. A few months ago my miniature Schnauzer had his teeth cleaned and needed six extractions. I thought because of his missing teeth he would not be able to eat dry kibble as before. At Raiders recheck, the vet told me missing teeth would not cause problems for him and indeed, he chews dry kibble without any problem. 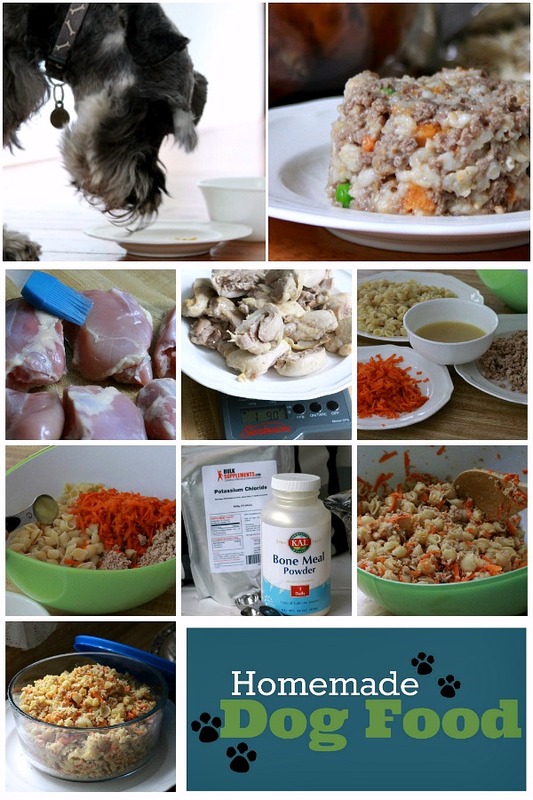 During his two week recuperation, however, I did lots or research on making homemade dog food. Marion Nestle, a human nutrition expert, is the author of three prize-winning books about human food issues, including “What to Eat.” Nestle has a doctorate in molecular biology and a master’s degree in public nutrition. Malden C. Nesheim is an animal nutrition expert and co-author of “Nutrition of the Chicken.” He is provost emeritus and professor of nutrition emeritus at Cornell University, and he has a doctorate in nutrition and a master’s degree in animal nutrition. Chapter 21, The Home Cooked, was exactly the information I was looking for. The fundamental principles of nutrition: balance, variety and moderation are discussed in providing complete and well-balanced diets for dogs and cats. I was surprised to learn making Raider’s food was not expensive, complicated or all that time consuming. And, he LOVES it! The most important piece of equipment is a kitchen scale. 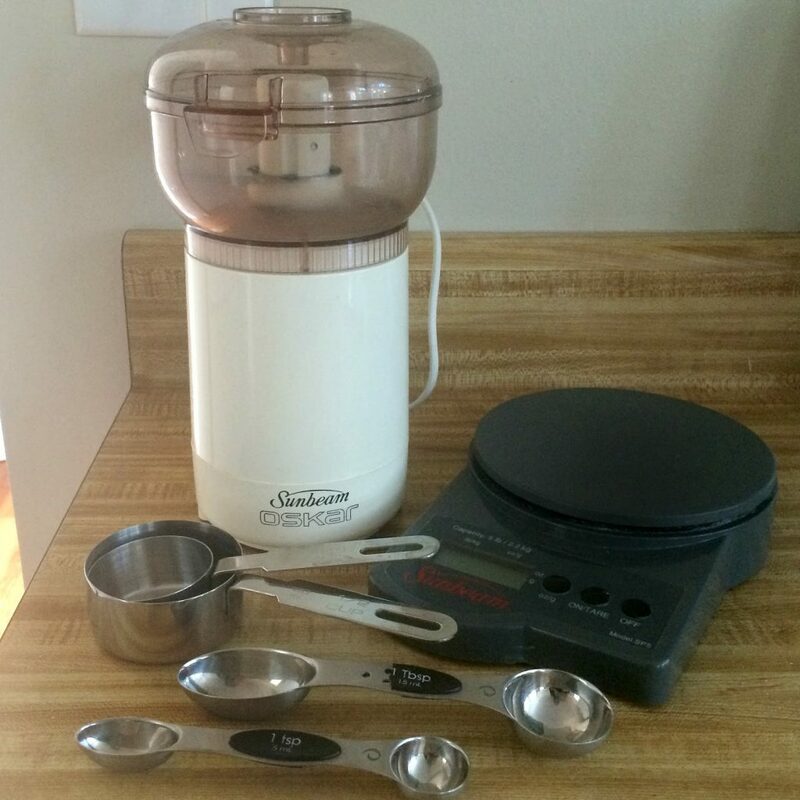 A food processor and measuring cups and spoons and you are ready to begin. We have simplified the process by placing a rectangular plastic container on the scale and taring it; then adding the correct amount of cooked grain. Tare; add the correct amount of cooked protein. Tare; add the vegetables. Remove the container from the scale and stir in the fat and supplements. I smooth the mixture evenly with a spatula and slice into correct number of portions. If the mixture is a little too crumbly, stir in some water or liquid from cooking the protein. 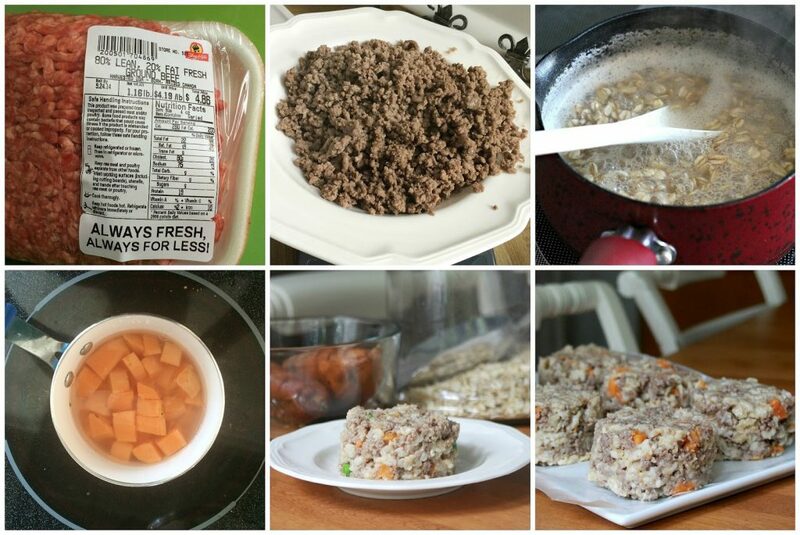 Cover and refrigerate portions for a day or two of meals; freeze the rest. For the first few weeks, Raiders entire diet was homemade. Gradually I added kibble and currently am feeding him half kibble and half homemade. He has never been happier about his meals! I had his veterinarian take a look at the formula I have been following and she approved. The following is a page from Feed Your Pet Right. I usually triple the quantities, divide into individual portions, refrigerate a two-day amount and freeze the rest. Then, for each of Raiders three daily meals, I stir together the homemade dog food with equal amounts of dry kibble. We keep an eye on Raider’s weight and adjust portions if needed. 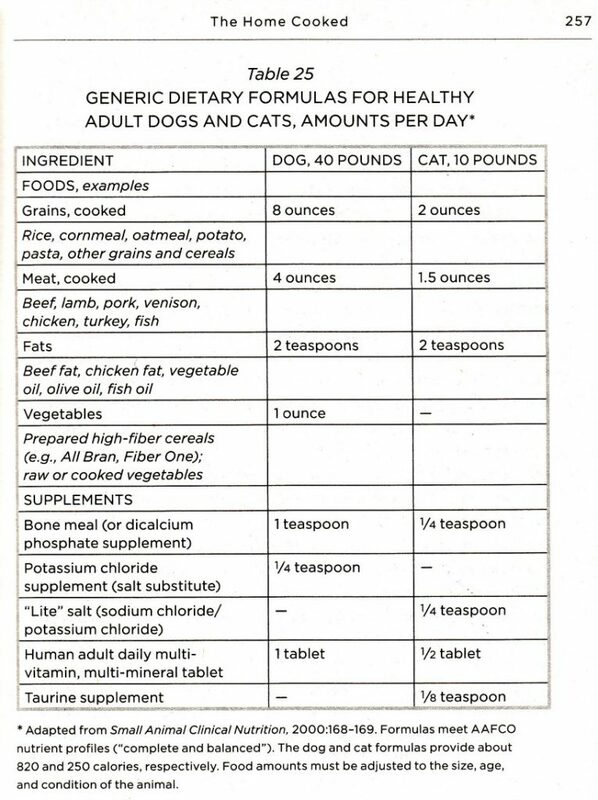 The above chart is the guide I am using to prepare food for Raider, adjusting the quantities since he weighs less than 40 pounds. Cook the ingredients separately and then mix them together.If you have a small dog, you can cut the food into small pieces or give it a spin in a food processor. Add the vitamin/mineral supplement just before serving. Because foods contain different nutrients and in different proportions, it is important, just as it is in our human diets, to vary the foods frequently. And, keep portions in balance, adjusting to your pets caloric needs. 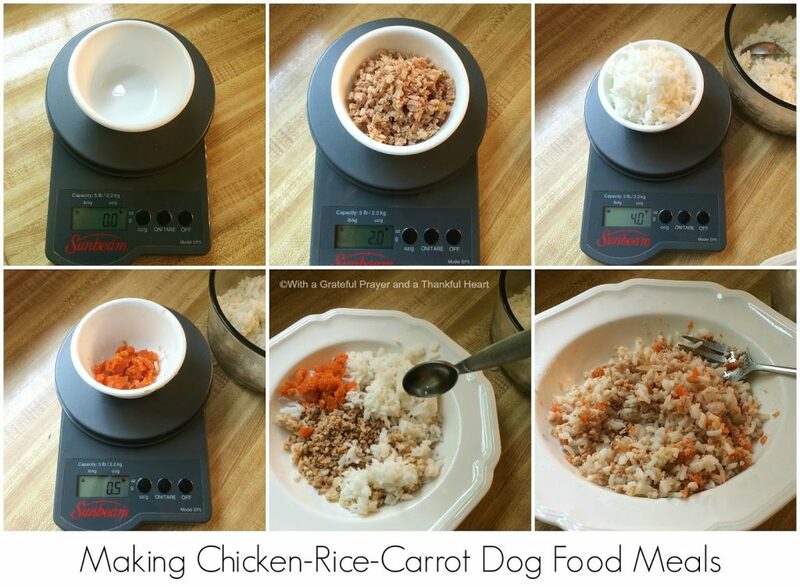 Making homemade dog food has been a learning process but I want to share a few notes I’ve learned along the way. The photos below were taken when I was making smaller amounts and measuring individually. By using a larger container and using the tare option on the scale, I don’t dirty so many bowls. 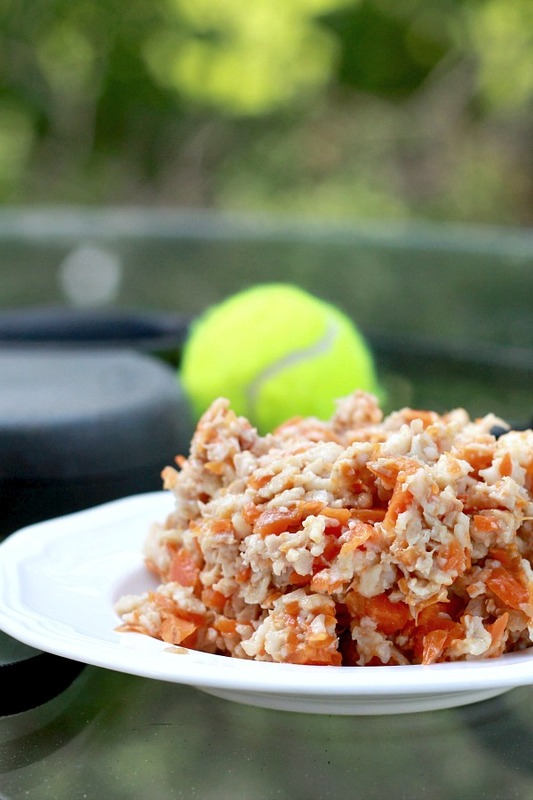 1-oz cooked carrot = little less than 1/4 cup cooked carrot or 3 Tbs. per above guide, Raider needs 1/2-oz vegetable per day, or 1 1/2 Tbs. Dicalcium Phosphate (bone meal) and Potassium Chloride (salt substitute) are important supplements needed in homemade dog food. I purchased them online. 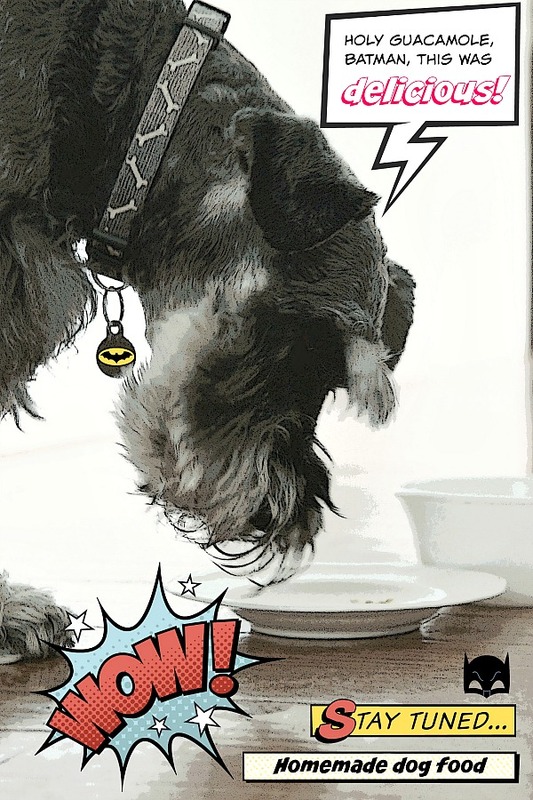 You have probably heard that chocolate, grapes and raisins are harmful to dogs, but there are many other people foods that need to be avoided as well. Chocolate, Coffee, Caffeine: These products all contain substances called methylxanthines, which are found in cacao seeds, the fruit of the plant used to make coffee and in the nuts of an extract used in some sodas. When ingested by pets, methylxanthines can cause vomiting and diarrhea, panting, excessive thirst and urination, hyperactivity, abnormal heart rhythm, tremors, seizures and even death. Note that darker chocolate is more dangerous than milk chocolate. White chocolate has the lowest level of methylxanthines, while baking chocolate contains the highest. Alcohol: Alcoholic beverages and food products containing alcohol can cause vomiting, diarrhea, decreased coordination, central nervous system depression, difficulty breathing, tremors, abnormal blood acidity, coma and even death. Grapes & Raisins: Although the toxic substance within grapes and raisins is unknown, these fruits can cause kidney failure. In pets who already have certain health problems, signs may be more dramatic. Raw/Undercooked Meat, Eggs and Bones: Raw meat and raw eggs can contain bacteria such as Salmonella and E. coli that can be harmful to pets. In addition, raw eggs contain an enzyme called avidin that decreases the absorption of biotin (a B vitamin), which can lead to skin and coat problems. Feeding your pet raw bones may seem like a natural and healthy option that might occur if your pet lived in the wild. However, this can be very dangerous for a domestic pet, who might choke on bones, or sustain a grave injury should the bone splinter and become lodged in or puncture your pet’s digestive tract. You care so much for your sweet pup! I know Raider is really enjoying his home cooked meals! I am wanting to go to homemade food for my cats when my Chessie is gone. I think Gracie would benefit from it due to allergies. (We are currently feeding them Grain free cat foods). I also think Abby Gail would benefit as she is half wild anyway. I am glad to hear that it isn't hard to do because it is intimidating to even think about. Raider is a lucky dog to have a mom who cares about him so much. That looks good enough to eat myself…lucky doggie!! You are a very good mom to Raider. So glad that he is liking his new food. That little schnauzer is one lucky pup! !